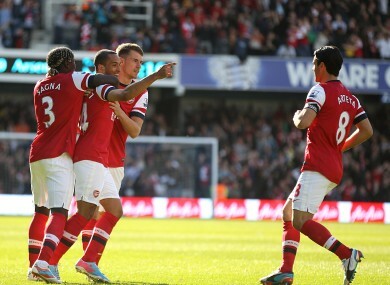 Arsenal's Theo Walcott (second left) celebrates with his team-mates Aaron Ramsey (second right), Bacary Sagna (left) and Mikel Arteta (right). THEO WALCOTT FIRED the fastest Premier League goal of the season as Arsenal moved back up to third place with a 1-0 victory at relegated QPR on Saturday. England winger Walcott struck after just 20 seconds to help Arsene Wenger’s side establish a two-point gap ahead of fourth-placed Chelsea, 24 hours before Rafael Benitez’s side travel to Manchester United. The Gunners were given a late scare when keeper Wojciech Szczesny was forced into a save from Loic Remy, but otherwise this was a comfortable step towards qualifying for the Champions League via a top-four finish. For QPR, there was only more disappointment following a painful week after last weekend’s relegation at Reading as they slipped to the bottom of the table. Tottenham’s late victory over Southampton meant Arsenal had slipped back to fifth spot by the time they kicked off, but the news from White Hart Lane provided extra motivation for Wenger’s men. And they were ahead in quick time after unpicking the Rangers defence with a deceptively simple move that was capped by Walcott’s right-footed finish for his 20th goal of the season. The home side had touched the ball just once before Tomas Rosicky’s right wing cross found Aaron Ramsey who headed down into the path of Mikel Arteta. The midfielder feigned to shoot, wrong-footing centre back Clint Hill, then slipped the ball to Walcott breaking inside the area and the winger’s shot was powerful enough to find the net despite the efforts of keeper Robert Green. Walcott had scored after just two minutes against Manchester United last time out but the Gunners had been unable to hold onto the lead with the newly crowned champions recovering to force a draw. This time, though, they were facing a side recently condemned to the Championship and the pattern of the first half suggested they were unlikely to suffer a similar disappointment. Arsenal were in complete control and should have added a second long before the interval. In the 26th minute, Walcott produced a shot on the turn that struck the woodwork and would have led to the visitors’ second had Rosicky followed up with more determination. QPR offered little by way of response and their efforts were summed up when Remy shot wastefully wide from 35 yards when he had team-mates in support. Park Ji-Sung did little better when he found space inside the Arsenal penalty area only to send his effort high over Szczesny’s crossbar. Rangers chairman Tony Fernandes had led the inquests into the club’s failure to stay out of the bottom three this season, condemning the efforts of some of the expensive recruits as unacceptable. And there was little during the opening 45 minutes to suggest the chairman’s view was misguided. Boss Harry Redknapp attempted to spark his side into life with the half-time introduction of Shaun Derry for the unimpressive Stephane Mbia. And the changes appeared to have the desired effect as QPR finally showed signs they could yet go down fighting. Andros Townsend tested the Arsenal goalkeeper with a powerful 25-yard shot that Szczesny was forced to punch away. The revival didn’t last however, and it was Green who was by far the busier keeper as the second half progressed. The England international, recalled in place of Julio Cesar who was missing from the home squad after a week in which he has been linked with a move to Arsenal, was twice called into action, first to deny Santi Cazorla and then yet another effort from Walcott. Arsenal maintained control and apart from Remy’s effort, they secured the points with ease. Email “VIDEO: Quick-fire Walcott lifts Arsenal into third”. Feedback on “VIDEO: Quick-fire Walcott lifts Arsenal into third”.